The romantic look is in. Your wedding in Bahamas planning is in full swing. And, of course, flowers play an integral part in your wedding day vision and style. Floral trends factor into your event design in a big way. We chatted with the owner of the popular floral design company RA Hurley for a bird’s eye view of trends in wedding in Bahamas flowers. 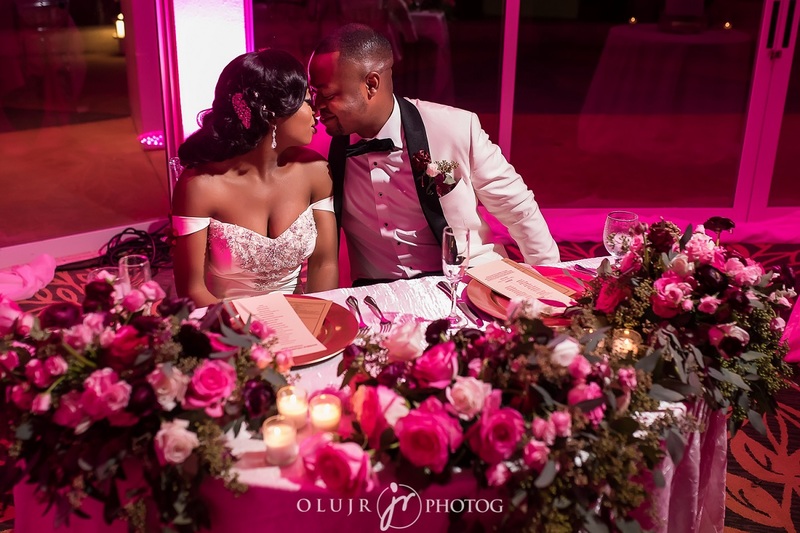 Personalized details come into play as well … “There are so many little things that you can do that add a special personal touch to your floral look and feel when getting married in the Bahamas,” says Robert Hurley. A mix of formality and casual is in. For your Bahamas wedding a navy blue striped runner, sea glasses up and down a dinner table add a nautical touch. More individualized looks is a big trend. Loose and romantic green plants and succulents create stunning looks. Romantic wedding arch by the seaside at Grand Lucayan, Grand Bahama Island. 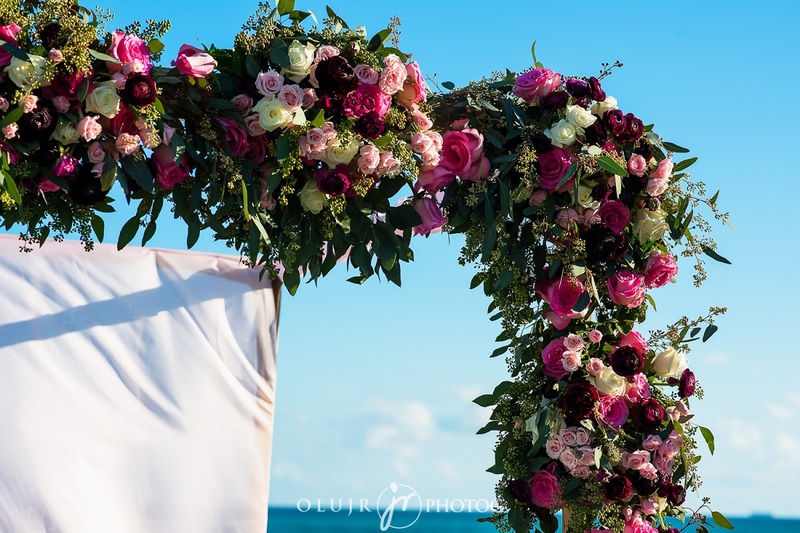 This arch was heavily designed with lush burgundy, blush florals. Wedding in Bahamas … Sweetheart table adorned with beautiful burgundy Ranunculus, roses and eucalyptus. 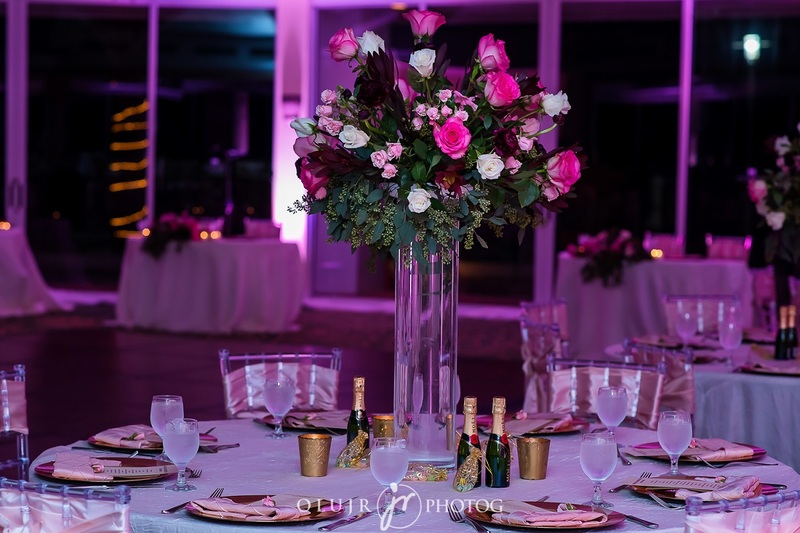 Tall table centerpieces featured at an evening dinner at this Bahamas destination wedding. Outdoor settings for a wedding in Bahamas are beautiful. Stunning romantic, modern or green flowers are the perfect complement. In today’s world, there are more options than ever when it comes to planning your wedding. With a wide variety of catering options, venues, and themes, nothing is more exciting than planning the perfect wedding for you. International travel is growing easier and more affordable to the average couple with every passing year. As a result, destination weddings are growing in popularity. About one in ten weddings today are destination weddings, which is a big increase over the last decade. Couples are realizing the advantages of destination weddings over conventional ones. If you’re planning your wedding, consider a destination wedding. Chic Bahamas Weddings is happy to help you! Contact us today to start planning your event.